Mitt Romney says conversation with Trump "enlightening," "interesting," "engaging"
Mitt Romney had only words of effusive praise for President-elect Donald Trump after dinner with him in New York Tuesday. How does Trump feel about Kellyanne Conway questioning his Cabinet picks? Romney also said he was “impressed” by the transition effort and said of the Cabinet members announced so far that they “are solid, effective, capable people.” Wilbur Ross is expected to be named commerce secretary, and earlier Tuesday, the transition team announced Elaine Chao will be transportation secretary and Rep. Tom Price will be health and human services secretary. Romney knows Price and said they had talked about health care. “What an expert and solid thinker in that arena and others,” Romney said of the Georgia congressman. “Jeff Sessions is someone who I knew through my campaigns, helped me very early on, he has a distinguished record in the Senate,” Romney said of the attorney general nominee. And he also mocked Mr. Trump on foreign policy. Mr. Trump, Reince Priebus and Romney ate well -- appetizers included young garlic soup, frog legs, and diver scallops. 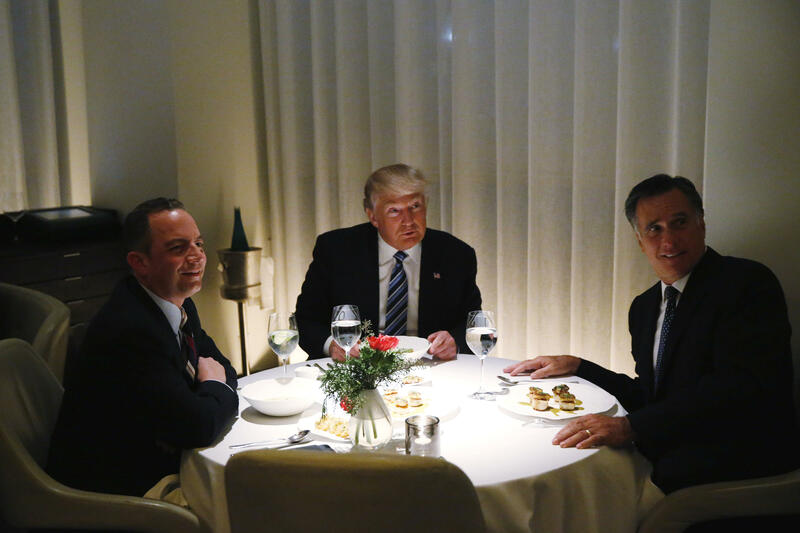 All three had red meat -- prime sirloin for Priebus and Mr. Trump and lamb chops for Romney. All three had chocolate cake.